Setting a new standard in high-end optical technologies, precision craftsmanship, and ultra-sleek functionality, the newly engineered Vortex Razor® HD is one of the finest spotting scopes on the market. Period. Premium HD glass lens elements, painstakingly hand selected and precision-ground to exacting standards, deliver brilliant, razor-sharp, true to-life views. 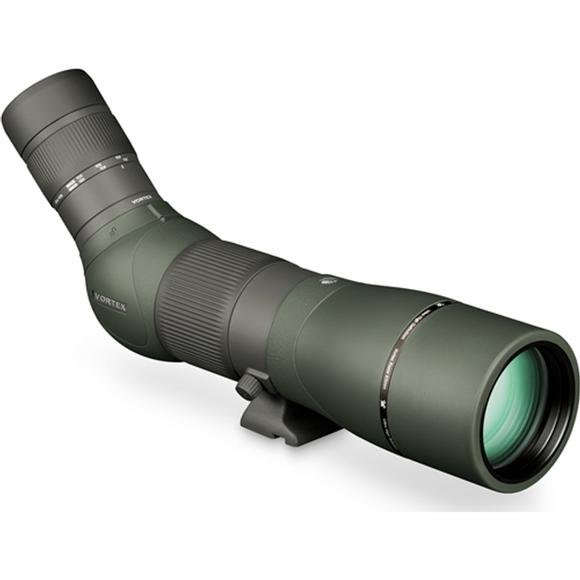 Setting a new standard in high-end optical technologies, precision craftsmanship, and ultra-sleek functionality, the newly engineered Vortex Razor® HD is one of the finest spotting scopes on the market. Period. Premium HD glass lens elements, painstakingly hand selected and precision-ground to exacting standards, deliver brilliant, razor-sharp, true to-life views. Advanced optical elements eliminate aberrations for distortion-free, flat field images with unmatched edge-to-edge sharpness, remarkable clarity, resolution, and color accuracy. Fully multi-coated with XR coatings, our new spotters yield maximum light transmission - an extremely critical attribute when finding and evaluating game in low light. Allows rotation of the eyepiece to a sideways position most useful for viewing through an angled spotting scope body on a car window mount.